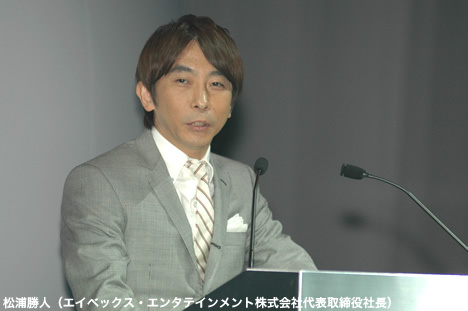 avex CEO Max Matsuura closes Twitter account due to JYJ fans? After getting flooded with comments from angry fans, it appears as if avex Entertainment CEO Max Matsuura has shut down his official Twitter account. The comments began coming in when fans discovered that a Chinese singer named Ray Chou - who is signed with avex - seems to have plagiarized a song written by JYJ's Jaejoong without his explicit consent. The song in question is "Wasurenaide", from Tohoshinki's last album as a five-member group, "The Secret Code". When made aware of the issue, Jaejoong himself made a comment in Japanese over Twitter. "'Wasurenaide' isn't my song or anyone else's song. It's a song by the five-member Tohoshinki. So I don't want one person or three people to sing it," he tweeted on July 17th. 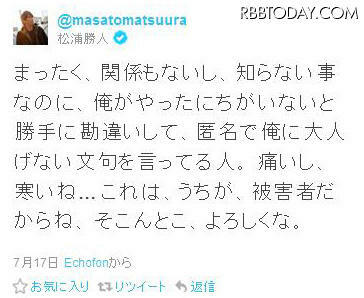 Meanwhile, Matsuura had been bombarded with tweets from JYJ fans demanding an explanation for the issue with Ray Cho. "It's something I'm entirely unrelated to and don't know about, but there are people willfully misunderstanding what I actually did and making anonymous, immature complaints to me. It hurts, and it's cold... In this case I'm the victim, so treat me favorably," he tweeted on the 17th. He also responded to another particularly slanderous comment by replying, "Since there's no reason why I'd do things like those, I'm taking a break from Twitter without so much as a photo!" These tweets inflamed fans even more, causing them to leave him further tweets like, "I'll stop when we get even for JYJ (lol)" and "You're the president of the company, but you call out a group like that," all directing their frustration over the matter towards Max. "Thanks for everything up until now. There are idiots out there like me (lol) I'm happy that there were people who... understood me. Well, goodbye for a short while!" The tweet was followed by another reading, "Well! See you again one day!" 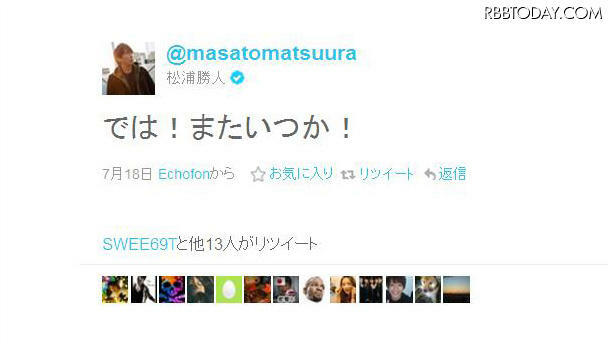 before Matsuura closed down his official Twitter account. Since JYJ is currently experiencing contract troubles with avex Entertainment, speculation has been popping up all over the net that the issue is related to the rocky situation between the two, but no statement has been revealed at this time. Buono! reveals track list for new mini-album, "partenza"!